Even though we are still up in the air as I write this the trip has been going ok so far. The trip though airport security was stressful. We were two people trying to get 4 pairs of shoes, carry ons, and a car seat through security. If we bad been there when they were busy I'm guessing we would have had our fair share of eye rolls. Moving through the airport was easy enough. 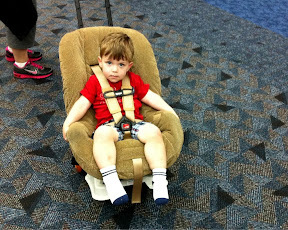 A coworker let us borrow a rolling car seat that we used to strap Luke into. 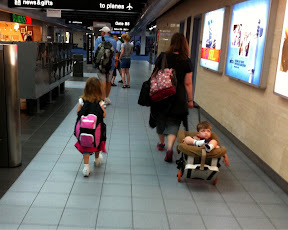 Moving through the airport was easy getting the car seat on the plane no so much. The seat fit and we got it buckled in. 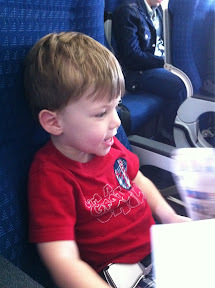 However it put him too far forward so much that he could push on the seat in front of him. Mom was sitting with Luke and was a miracle worker at keeping him happy and not kicking. Alyce has been a gem the whole time. 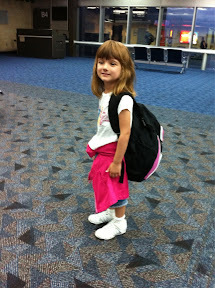 At six in the morning she's skipping through the airport. Disney World can do that. 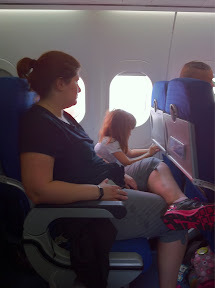 Sitting on the plane she looked out the window quite a bit and eventually started watching some shows on my phone. Before we even got off the ground we did have a funny moment. She pulled out the emergency pamphlet and started to look it over. She looked so grown up. Our flight to Orlando had a layover in Atlanta. Our plane landed on time but took a while getting to the gate.